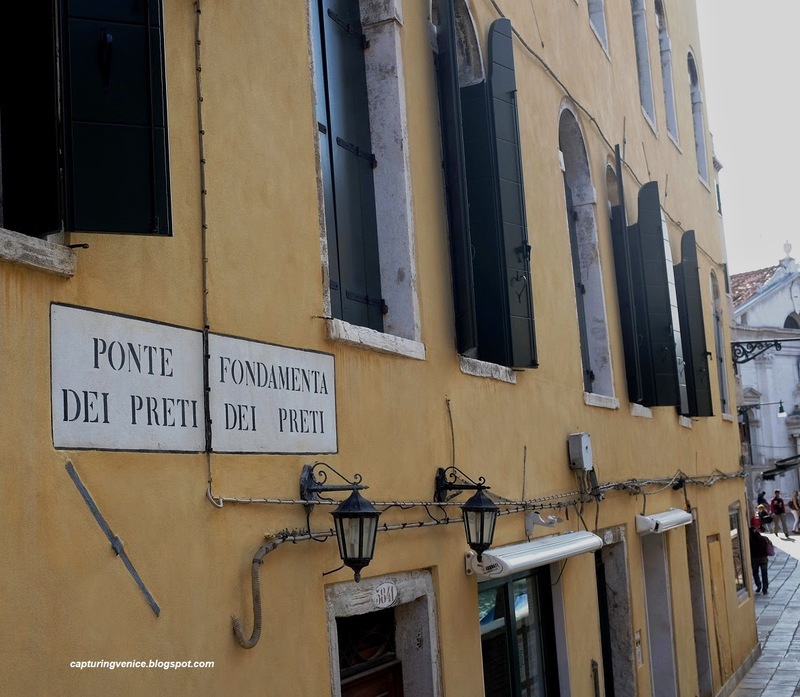 One morning, after downing a delicious coffee and warm, sweet pastry at Rosa Salva (ok, so maybe it was two of each), we headed off into the streets of Venice for another day of walking and looking. We walked across the Ponte dei Preti off the Campo Santa Maria Formosa and looked up to find this arch – the Arco del Paradiso. 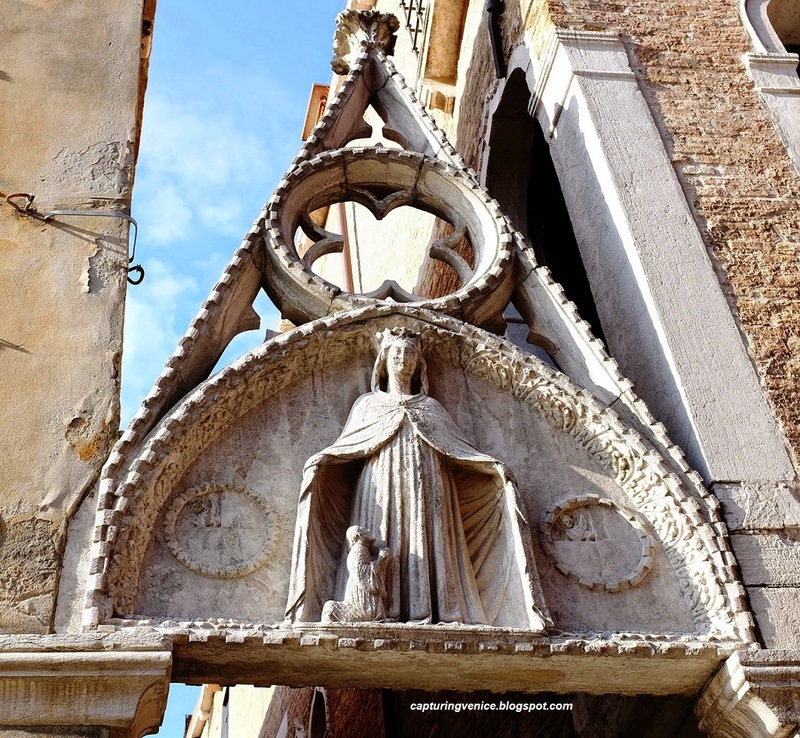 The arch dates from the early 15th century and commemorates the marriage between a Foscari and a Mocenigo, and bears both family’s arms as well as a relief of the Madonna della Misericordia. 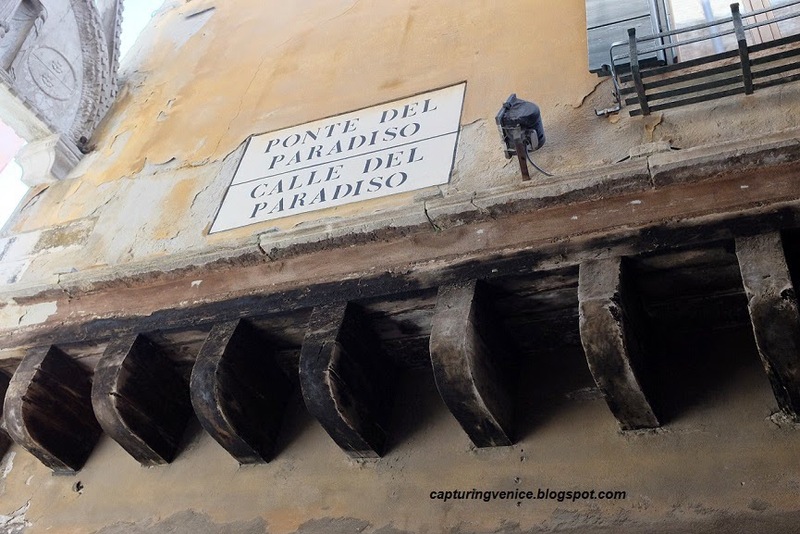 Twenty-six houses in this calle – the Calle del Paradiso – formed part of the marriage settlement. 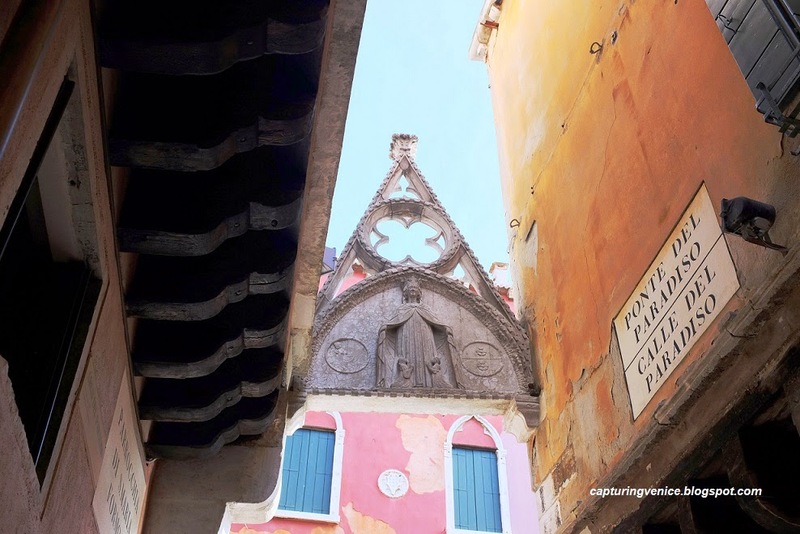 The calle itself is one of the best preserved medieval streets in Venice. 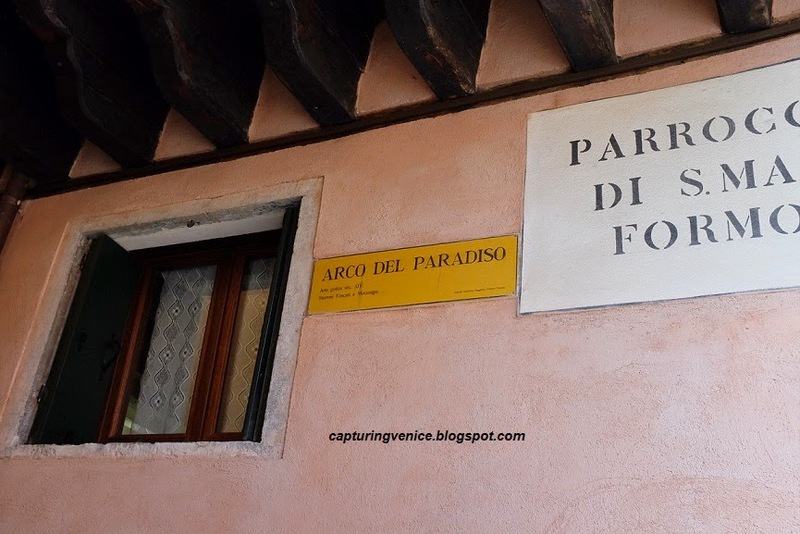 The narrow, short street comprises two parallel blocks, joined at the east end by the Arco del Paradiso. The ground floor was intended for shops and workshops, with a single storey of accommodation above, supported by barbacani. According to Richard Goy’s trusty Venice. 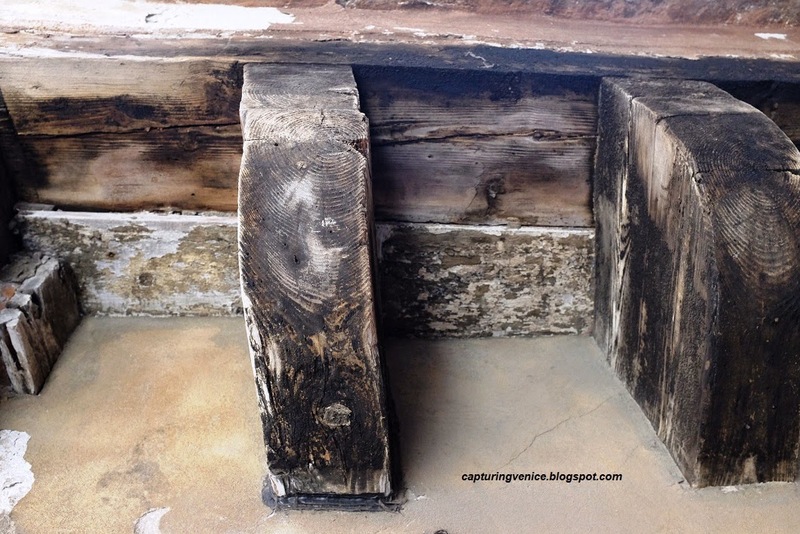 An Architectural Guide, the section toward the bridge contains some 13th century material as well as later medieval parts, whilst the section of the street toward the Salizzada San Lio is largely 16th century. Toward the Salizzada San Lio end of the street is one of Venice’s many fine bookshops. This one, Editrice Filippi, specializes in hard-to-find Venice titles in Italian and other languages. I’ve spent many happy hours examining its shop windows and deciding what other piece of clothing I can jettison in favour of another tome. On my last visit to Venice, we travelled to eight cities in three weeks, each of us carrying one small cabin bag on wheels. 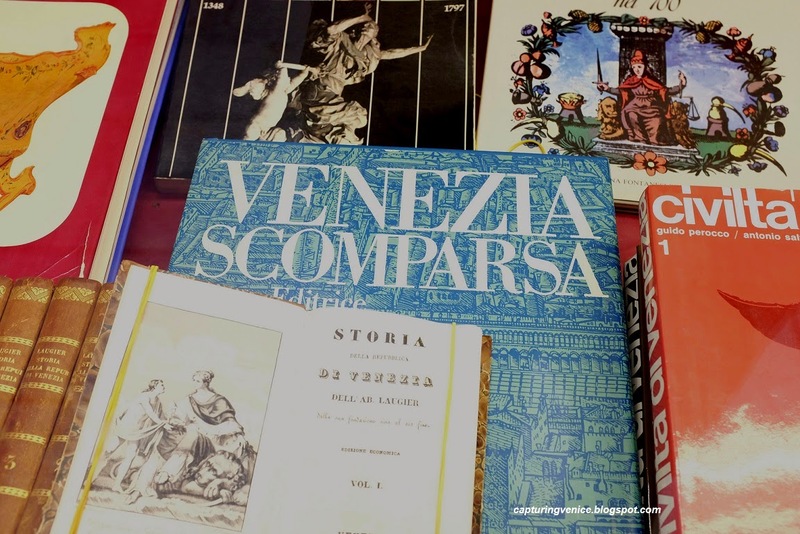 I regretfully decided there was no way I could fit Alvise Zorzi’s comprehensive, gorgeously illustrated Venezia Scomparsa in my small bag, nor nonchalantly waltz through check-in with such a heavy book in my luggage. Luckily, the bookshop kindly posted it to me.